Extract the milk from 1 the coconut. Grind remaining coconut with chillies, ginger, garlic and all the spices. Heat oil and fry onions until colored. Add spiced paste and fry until oil separates. Add meat. Stir and fry for 10 minutes. Season. Pour in 1 litre water. 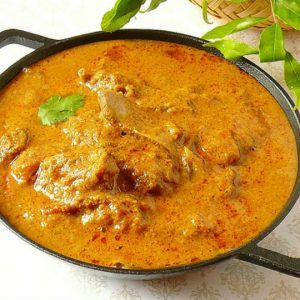 Feel free to comment or share your thoughts on this Madrasi Meat Curry Recipe from Awesome Cuisine.